At first glance, the Yedikule Gardens appear to be a sparse collection of private farms trapped amid the dawn of the days of Constantinople and the booming gentrification of modern Istanbul. These bostans, or vegetable-producing gardens made for the markets, are situated along the edges of encroaching apartment complexes and mall plazas while aligning the sides of historic Byzantine walls and Ottoman water wells. As generational families of farmers work to maintain these endangered spaces of vegetation, one would be keen to notice the symbolism in Istanbul’s ongoing struggle between tradition and progress. The Yedikule gardens exist as more than a valuable source of local food production. To some, “The work of the gardeners is holy work” (Kaldjian 2004, 287). Just as industrial terrain is a part of city expansion, agricultural land should also play such a role. These are the lands that allow humanity “to fully comprehend [a] city’s economy and urban change” (Shopov and Han 2013, 35). Though seemingly out of place with their ancient water wells and hanging laundry drying in the Mediterranean wind, the atmosphere of Yedikule preserve a period of Istanbul too precious to be left only to esoteric textbooks on gardening and agriculture. In the 1890s, the photographer Sebah took a photograph of the Yedikule gardens showing the precursor to what would today be the invasion of modernization. In his piece, the Byzantine walls run through bostans on both sides, accompanied by mosques in the distance. To the right most edge, the first living lodges are seen. Meanwhile, the main body of the photograph illustrates the abundance of flora still thriving near and far. 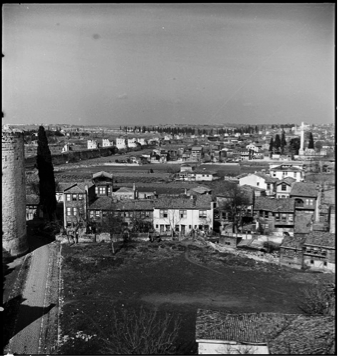 As of the late nineteenth century, Yedikule appeared lush and lively, with trees in the distance aligning the horizon while plots of land show signs of being tended and cared. Onto a photograph of the same region in February 1937 from the Artamonoff Collection, one immediately notices the drastic replacement of vegetation with houses. Much of the gardens within the walls have been replaced with the construction of concrete homes on gravel and cement. The same trees that once stretched across perpendicularly to the walls are now scant compared to the planted trees of residential homes. For the wall itself, there are now breaks and eroded segments, but its presence persists even against encroaching housing complexes. The changes in the vegetation are thus contrasted by the striking continuity of the Byzantine-Ottoman ramparts. 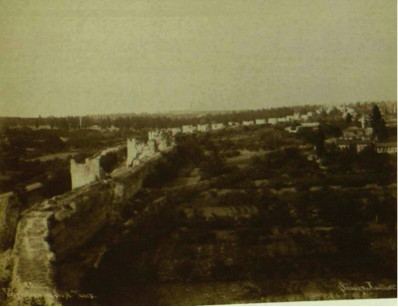 While once farmed-on land is now lived-on land, the same wall still sweeps over the area of Yedikule. 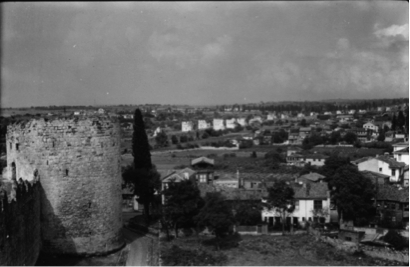 A year later in the summer of 1938, another photograph from the same collection illustrates the contrast between the still standing Byzantine walls and the vast neighborhood of two-storied houses with deciduous trees. The housing districts have now crept so close to the walls that they are almost touching the very bricks that once guarded the ancient city. The whole area resembles a scene out of an anachronistic film, pairing thousand-year-old walls with a neighborhood of the twenty-first century. Notably, a paved road in the foreground can be distinguished that is not prevalent in the earlier photographs. This remarkable difference depicts just how fast urbanization occurred within a little over a year compared to the second image. Fast forward to today, and one could perceive a certain sense of sadness coupled with urgency in the region. Tanker trucks encircle the few remaining wells in order to supply water for the pubic including hamams. One side of the walls could be mistaken for a developing American suburb while the other side displays the surviving fresh tava of spinach, mint, and even corn. If one were daring enough to climb and observe atop the walls, a turn of the head reveals almost two worlds converging against each other. To the left is a hopeful sign of growth, both literal in agriculture and symbolic in livelihood, and to the right is an uncertain desolation. No bostans remain on the right, and it seems all land has been reserved for more urban construction. Will apartments and malls be born out of this destruction? Will they also take over what greenery remains on the other side of the walls? These are the questions left to be answered but ironically, it is the fortifications that have endured, albeit with some damage and need of repair, while the once-protected interior gardens have given way to rising urban sprawl. The truth of the matter is that people need places to live, and a city needs space to grow. However, a greater truth is that historic cultures and traditions should never be neglected for the sake of potential profit and growth. Istanbul is a thriving example of bridging the past with the present, and Yedikule is a prime model for that challenge. Perhaps one day, humanity could find a way to resolve this conflict of culture versus expansion in which social traditions may carry on peacefully alongside progress.